In the immemorial times, Xishuangbanna is a part of the ancient Mediterranean; because of the Himalayan orogenic movement in the geological history, the ancient Mediterranean retreated westward and the place experienced a change from vast seas into yellow earth. But how can we prove what we said above? The witnesses of geological structures and the results from ancient living creature research are the most believable proofs. However, these are all �dead� witnesses, and sometime we cannot make the fact clear to people with them. It is lucky that we have more than 10 varieties of plants that could be used as living witnesses in Xishuangbanna, and thatch screwpine is one of them. After the disappearing of the ancient Mediterranean, it did not take Xishuangbanna with it into the sea. After many years of evolvement, the thatch screwpine becomes a member of the rain forests; more, it gradually suits the acid soil, the humid and dark forest environment, and it also changes its habit of growing on seaside. 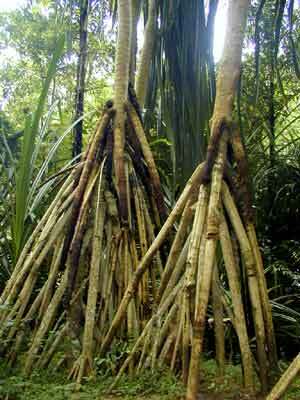 It might be for reasons of the gene, in the lower part of its tree trunks, thatch screwpine trees still have many aerial roots as supporting roots, which preserved its habit of breathing in the shoals. Thatch screwpine is a kind of small arbor tree. Its leave looks like a belt with a length of 1.5 meters and a width of 3 to 5 cm. Its fibers can be woven into various craftworks, its flowers are rich in perfume oil, its roots, leaves, flowers and fruits can be used as medicines for curing nephritis etc. We can find its traces in Canton, Guangxi, Fujian, Yunnan and Taiwan in China; it also scatters in other places of the subtropical areas and South Australia, and it often grows in the sands along the beaches.